Yesterday we were blasted with a huge blizzard that is still underway, but has managed to slow down a bit. I decided to put the plans I had on hold for today and possibly pull out my sewing machine and make a few new pillow covers instead. There’s no way I’m bundling up and heading out there! Right now I feel like we’re in between seasons, so I’m not ready to completely switch my decor over to spring. Instead, I think a few gradual changes will help shake off this wintery feeling that seems to be hanging on (someone needs to tell Old Man Winter it’s time to go!). 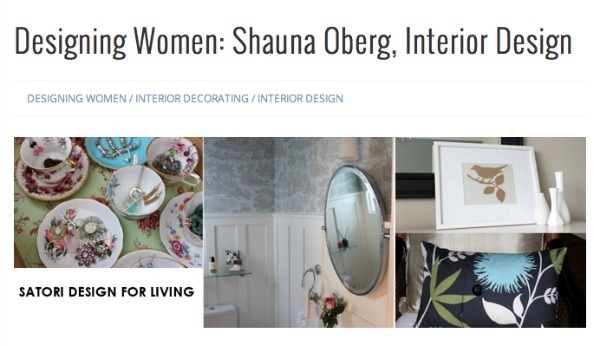 On another note, today I’m excited to be over at Signature Style Magazine sharing a bit about my design philosophy, how I got started in design, what a typical day is like for me, and a bit more. I’d love to see you there! Author Shandra Ward is a talented interior and event designer with over 20 years experience. Her work has been featured on HGTV, Houzz, Hostess with the Mostess, and more. We are about to be hit with a blizzard here! I have not let that stop me from changing up the decor on the inside. :) Heading on over to check out your interview! Excellent interview, Shauna. Congratulations! …and lucky Carol for being the Mabel’s Labels winner! I’ll check out your interview for sure! Stay warm Shauna and I hope you’re having a great day of sewing! Congrats on your interview, headed over for a peek!